We originally predicted the median sales price to drop to around $260,000 before leveling off. For three consecutive months, the median sales price of a single family home in Lee County Florida hovered around $280,000. Combine this with a tremendous surge in buyer activity in the past few weeks, and we may be nearing the end of the cooldown, statistically speaking. What this means and does not mean: Statistically we don’t expect median prices to fall much below $280,000 as we head into the busier summer months. With buyer activity increasing, and tradtionally strong summer months upcoming, look for sales activity to pick up over 1st and 2nd Qtr 2006 levels. We will not match 2005 activity levels. Look for more normal sales levels posted in 2003 or 2004. This does not mean that all sellers are OK on their pricing. When the SW Florida housing market was red hot, we still had some over priced sellers who didn’t sell. When the market cooled, we had over priced sellers who were caught chasing the market down, and haven’t sold. In any market, you will always find over priced homes that do not sell, regardless of how hot or cold the market is. There are also hot and cold pockets within our market. Not every property or development is hot, nor is every development cold. Each one should be evaluated on it’s own merits. What’s in store for the balance of 2006? Buyers will look back on May and June of 2006 as one of the best times to buy. Inventory selection is high, interest rates are low, and the buyer is probably in the best buying position they’ll be in for awhile. As rates climb, this will erode their home affordability, making mortgage payments higher. If a buyer is waiting for the market to fall let’s say another $10,000, those savings will be eaten up by higher payments due to interest rate changes. It will actually cost a buyer if rates go up 1/4 percent, even if home prices decline $10,000. So now is the best time for home buyers to buy as we don’t see the median price dropping much from these levels. We also don’t see prices going up much for awhile either, due to four wildcards. 1. Interest rates are rising, thereby crimping buying power from purchasers. 2. Property insurance is rising, and with each hurricane, insurers are getting more nervous. As each insurer pulls out, it makes the remaining insurance more expensive, raising payments on buyers and crimping their purchasing power. 3. Property taxes are rising due to increased property values. Many local buyers can’t afford to upgrade because their property taxes will go up once they sell and buy another home. Florida needs property tax portability to alleviate this situation so Floridians can afford to move if they choose witout being taxed out of house and home. 4. Inventory levels are high. While median prices may have moderated, it will still take awhile to work through all of this inventory, which should cap price increases for awhile. I don’t think seller price reductions are over. Sellers need to evaluate how their home stacks up against the competition. The sellers who are the most price competitive are selling right now. They have set the floor, and the market is responding. The sellers who are over that floor are sitting on the market. When they reposition their home in the marketplace to where the buyers are, their homes will sell. We also have some investors in the market who should have never been there. These weren’t long term wait and hold investors, rather quick flippers who didn’t have tolerance for this type of correction. They helped fuel the rapid increase, and can least afford the decline. As we work through these inventory levels, prices will stabilize. The overall market has alraedy fallen. Some price ranges have been hit harder than others, and this is normal. Some price ranges became too bunched up. Many $450,000 homes were too similiar in size and features to $500-550,000 homes. Something had to give. Either the $550,000 had to go up, or the $450,000 home had to come down as there wasn’t enough price differentiation. I’ve seen this phenomenon several times in our career. As the market heats up, buyers are forced to buy whatever they can, or be left out of market. This leads to some price inequities that need to be rebalnced later. Our market has been doing this for about 6 months or so, and it is actually healthy. Bottom line is , single family median home prices have bottomed. This is not to say that every home in Lee County has bottomed. The homes that are priced to sell now will sell because buyer activity is really picking up now. Homes priced over the market need to make some adjustments to get in the game, and when they do their homes may sell too. Buyers can feel comfortable again wading into this housing market. There is pent-up demand from buyers who have been holding off waiting for prices to come down. The wait is over, and the time to jump in is now with excellent selection, bargaining power, and low interest rates. The same may not be said forever. It’s always fun to sell in a "Sellers Market" and buy in a "Buyers Market". We have a Buyes Market today, so have fun while it lasts. Condo sales are another story. Insurance issues are really affecting maintenance fees as insurers pull out of the condo market. Look for more associtaions to raise their fees as they replace existing insurance with higher priced replacement insurance. Look for a detailed State of the Market Report update coming in June or July. Because the market has changed so much in the last 6 months, we’ll do a mid year update to our annual report. Sales of new homes rose unexpectedly in April to the fastest pace this year. The Commerce Department reported that sales of new single-family homes increased by 4.9 percent last month to a seasonally adjusted annual rate of 1.198 million units, the highest rate since last December. Economists had been expecting a decline in sales, and were surprised by the news. SW Florida new home sales are off, however resales have started picking up in recent weeks. SW Florida real estate may have bottomed out and leveling off. We’ve seen three straight months of price stability, and April results are due to be released anytime. Inventory levels have risen in Fort Myers, Cape Coral, and all of SW Florida, so it will take some time to burn off all that inventory even if prices are stabilizing. Some local areas will do better than others due to inventory imbalances. Just because the overall market may be stabilizing doesn’t mean every home will fare well. Even in the Hot Hot market we had the last three years, some sellers were over priced. On the way down, there’s no reason to believe that will change. There will always be some sellers over priced no matter what the market is. It pays to consult a professional regardless of whether the market is hot or cold. And with relatively low rates and excelllent selection, buyers may look back on May/June 2006 as the best time to have bought real estate in SW Florida. Lee County schools that scored well in math and reading also did well in science. Sanibel School scored the top score among Lee County’s elementary and middle schools, while Fort Myers High scored the county’s highest score among high schools. Collier County FCAT scores were up in science for 5th grade. While Collier County students improved in 1th grade science, Collier County students lag the state in 8th and 11th grade science scores. Barefoot Beach received this Top 10 ranking for water quality, open sand, management of the beach, and facilities available to beachgoers. I’ve been to Fleming Beach in Maui, and of course Barefoot Beach. I also like Fort Myers Beach, and the Lido Key Beach in Sarasota Florida. The National Hurricane Center has released their annual prediction for the 2006 hurricane season. Look for 2006 to be a busy season as Atlantic temps are warmer. In this report we’ll tell you where to find deals on generators, and how to avoid paying sales tax on certain items during Florida’s sales tax holiday for hurrucane supplies. We’ll also grade past NOAA hurricane predictions for Florida and the Atlantic hurricane season. It’s probably too late to protect yourself with hurricane Shutters this hurricane season. We highly recommend Storm Smart Systems for hurricane protection as they do an excellent job installing and evaluating your needs. SW Florida has been hit in recent years. Residents have learned that by following a simple plan before storms hit can protect against misery after a storm hits. Simple items go a long way. FEMA tells everyone all you really need to do is be prepared for three days on your own. FEMA shoould be to you by then. Those without power or air conditioning for two weeks or more see it a bit differently though, and they’re not waiting. They’ve been buying gas cans, generators, and portable air conditioners. Great article featuring The Ellis Team at RE/MAX Realty Group in Fort Myers Florida and how we use technology. Some of the newer things we use are Podcasts, Tablet PC’s to do contracts on the road, Virtual Tours using Podcast technology so the Tour is also searchabloe on the Internet. Technology has made us much the Ellis Team much more efficient in SW Florida real estate. We are able to demostrate to sellers in SW Florida how we’re able to sell their real estate property faster than other agents using these innoavtive technologies. It creates a real wow for sellers in SW Florida. Have you heard of "What’s with the 50 Questions?" Well, it may not be 50, but it’s darn close. We’ve developed a list of 49 Questions you should ask your Realtor before you hire them to sell your home. We developed this for Homeowners interested in selling their SW Florida real estate, however the list works anywhere. The biggest mistake sellers make is they think all Realtors are alike and work the same. Nothing could be further from the truth. The other mistake sellers make are picking agents who reccomend the highest price, selecting a friend or relative because they feel obligated, or going with the lowest comission, believing they’ll end up with more money in their pocket at closing. All these mistakes can be avoided. You won’t even have to ask all 49. After about 10 questions selcted by You, you’ll get a good feeling on where this agent stands, and how they hold up to scrutiny. We love it when sellers print out this list and ask away. That’s why we post it right on our website. Entry level salaries are jumping the highest in 2006, by as much as 18%. Almost accross the board salaries will be inreasing as the school district focuses on adding new teachers, and retaining existing teachers. In 2004 Lee County hired 836 teachers. Our school district is growing, and we must hire teachers. Lee County Florida is a great place to live and work, and business is booming in SW Florida. Latest job relase figures show unemplyment fell to 2.1% in april 2006, down from 3% in April of 2005. Basically, anyone who wants a job can have a job in SW Florida. Companies are hiring. Florida is a destination state because so many move here from colder climates, and growth fuels growth. As the economy heats up, look for even more hiring in the coming months. 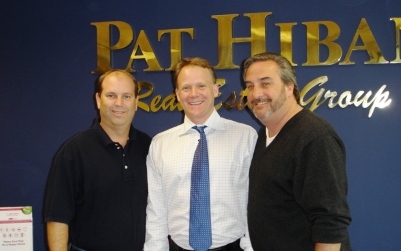 Pat Hiban is the leading agent in the Washington DC area, and his office is located in central Maryland. Pat’s office is simply amazing. Pat came up with the Sensible Listing and allowed the Ellis Team to use it several years ago. John Bendall is one of New Jersey’s leading real estate agents, and has been so successful he opened up three RE/MAX offices as a broker in the past year. John is President of his local Board of Realtors in New Jersey, and is very influential in the industry. Together Pat and John are often asked to speak at national conentions and conferences. Brett, John, and Pat met at Pat Hiban;s office to discuss trends in real estate, changes in the marketplace, and advanced marketing techniques. The trio compared office systems, technology, personnel, office space, company vehicles, branding, media presentations, commercials, MLS systems, International marketing, investor relations, and a myriad of real estate topics. Spending time with the Top Agents in the industry helps each one of us. We learned so many things that we can bring back to the SW Florida real estate market, and much of what we learned translates into results for our clients. Agents from all over the country pay top dollar to shadow these agents for a day. Once in awhile, it’s good for us to get together and compare notes and strategies. Pat, John, and Brett will meet up again along with 200 of the Nation’s Top Agents in New York City at the annual Star Power Conference. John, Brett, and Pat all teach at the conference, and share their wisdom to aspiring agents from all over the country. Pat, John, and Brett last taught together at the CRS (Certified Residential Specialist) Convention this past January in San Antonio Texas.